Movavi Photo Editor for Windows 10 - A simplified image editor for simple photo processing. With it, you can perform color correction, add a filter, work with signatures and other trifles. The program has a setting of brightness, sharpness and contrast, add text, remove unnecessary objects in the image, change the size and background of the picture. In general, it is suitable for quick, everyday editing of photos that do not require the editor to have brushes, layers and tools for fine adjustments. 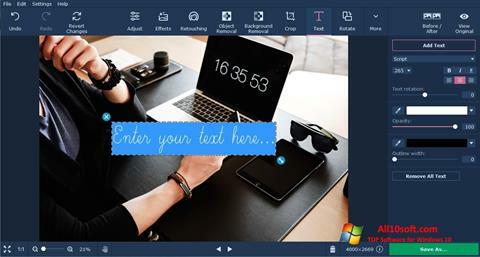 You can free download Movavi Photo Editor official latest version for Windows 10 in English.